Lonely situated traditional villa with 1000 m2 in level arranged tree-planted garden with exceptional view to the sea and nearby village 'Dilinata' and area. Two-levelled housing with separate external approach: each level one bedroom-suite with own shower WC room (large convenient). Kitchen dining room upstairs.Each level with private terraces.On the thrid level down to the garden (out of six levels) free shaped private pool (-1,10 up to -1,80) not children safe, with a big sofa, sunbeds and table under the shade. The newly built kitchen is fully equipped with cutlery dishes etc. electrical stove and grill, microwave, coffee machine, water kettle,dishwasher. TV with SAT (Hotbird) installation. Private parking under shade. Seaside equipment, baby cot, washing machine. The location of the village is very quiet without any noise of cars etc. In 10 minutes car driving away from the capital town Argostoli (ATM and super markets) , or the nearest beach Makris Gialos or Platis Gialos. Perfect relaxing place for family (children over 4 years old) or two couples. 'Il Suo Paradiso' is really a paradise of relaxation... It combines the beautiful endless views with nature sounds, which everyone needs in order to relax from the hectic ways of living. Apart from the actual beauty it also has a connection to previous generations, as passed down to us, reminding us our bonds to Kefalonia. Both shower rooms with toilets are very comfortable in size . Both showers are a size of two persons at the same time. The pool is 29 sqm big. The depth from 1.20 m to 1.80 m. Not young children safe. We rented this beautiful house at the end of the season, so a few very forgivable little issues with things not quite working as they should. The house in on two layers, large bedroom, with the biggest bed I have ever slept in, with bathroom on the lower deck. Kitchen/Diner, bedroom with twin beds and bathroom on the upper. No internal staircase so if you are travelling with kids this may be an issue. The doors to lower bedroom and front door both slam lock, so keeping track of your keys is important! would be a great idea to have spares in each location so if the worst happens then you don't have to call a lock smith! The pool is great but would benefit from a cover late in season just to keep the heat in. The kitchen is the best equipped we have come across on our many rents, you can easily cook up family meals here. Roxanne has to be the most attentive host, we never actually saw her but had phone calls to the house to make sure we were OK, during our stay we caught a little hurricane and thunder storms, all very exciting when you are this far up in the hills. The garden sustained a bit of damage, but gardener and pool maintenance were in attendance as soon as it passed to make sure we retained the benefit of the lovely garden and pool area. We highly recommend this house if you are looking for a quiet out of the way place. Restaurants and night life are all a drive away, one little Taverna in the village run by Alice and her family, they had just moved in in September 2018, food very basic but kind and friendly people as where the locals. Food in general was a bit of a disappointment on the Island, big places in Argostilli that I am sure many people will like, but they do know how to charge (£5 for half a Peroni, thought I had been robbed!). Here you can find Italian, Chinese even Sushi, but good Greek food is hard to find. We did find a very honest little Teverna run by Popi & Kosta called Milos in Farsa, doesn't look much from the outside but boy what a view, Kosta cooks well and entertains with his old traditional instruments, not in an annoying way in your face, just sits and plays a bit now and then. On one visit there was a young local family in, dad & daughter danced traditional dance while Kosta played, really nice to see, not a show, just local people enjoying and behaving naturally. Fantastic week on our first stay on the island. House excellent, lovely pool and views of the valley. 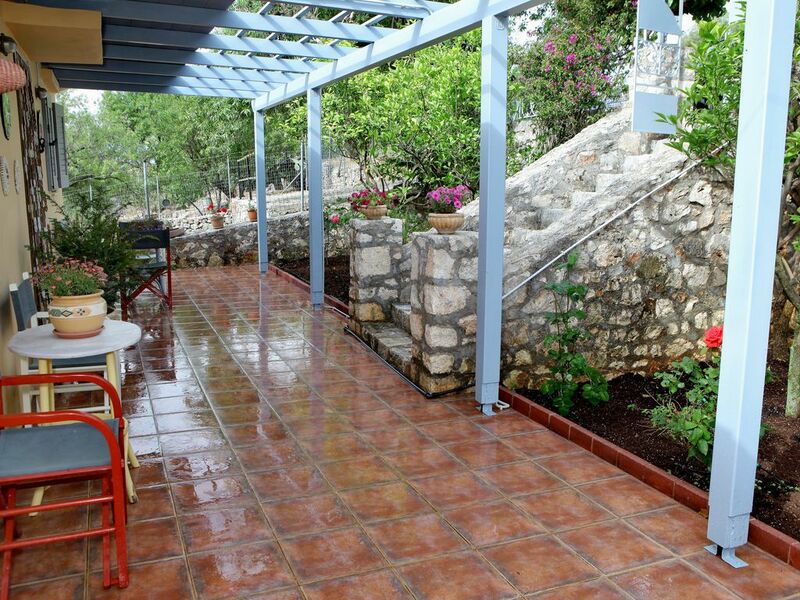 The house was really well equipped, the terrace and sitting areas were also excellent. A big space and garden for four people, not overlooked, really private, very quiet. Only downside we found that there was the Restaurant in the village was not great and so we did not eat there. Hence if you want to go out you need to drive down to Argostoli. We parked at the bottom and walked across the bridge into town. Would recommend this property. Nice property inside and out. We had a great stay with our two children at Il Suo Paradiso. It is well equipped, beautifully decorated and has a great garden and swimming pool with lots of outdoor space. It is located in a quiet village, very peaceful with a really nice view of the valley but close to Argostoli and well located for traveling around Kefalonia. We would definitely stay here again and would recommend it to a family looking for a base for seeing the island and for relaxing and enjoying some quality time in a really nice property. We spent a week in this amazing villa. Everything you could possibly need is there. We had a fantastic time during our stay and Roxane was so helpful and considerate. The views from the villa are breathtaking and the overall care and upkeep of the villa, pool and the gardens was fabulous. Villa very clean, stylish and decorated to high standards and set in a private location with the sounds of nature and the goat bells. Looking forward very much to going back! My husband and I have just had the most amazing week at il suo Paradiso, we were looking for a peaceful, relaxing place to stay, with privacy and a quiet area, that’s exactly what we had at this villa, we loved everything, and particularly the super pool where we spent hours, with just the bells on the local goats as a background noise, perfect! We slept really well, and enjoyed sitting on either of the verandas in the evening, playing cards and chatting, I loved getting up in the morning and sitting having my morning coffee and looking at the wonderful views. The villa itself is very well equipped, and Roxane was quick to answer any questions and it was lovely that she called us when we arrived with additional information and tips, and the housekeeper kalimoria and her lovely daughter came and cleaned the house half way through our stay, beds changed, floors mopped, dishwasher emptied, all was really appreciated! So to summarize, we loved our stay, and left feeling very relaxed and rested, and we will definitely be booking again. liebe Roxane - vielen Dank für eine wunderbare Woche in deinem kleinen Paradies! Es ist alles zu unserer Zufriedenheit gewesen. Das Haus ist in bestem Zustand und alle Annehmlichkeiten, die wir für einen entspannten Urlaub gebraucht haben sind vorhanden gewesen. Davgata is a very quiet village in the hill area only 5 klm away from the capital town Argostoli. Although near situated, nothing disturbs the silence apart from bird singing, cicades and sheep flocks. Ideal for country walks, bicycle riding, and romantic stay. In the village only 5 min by foot a fantastic traditional tavern with home cooked meals, exceptional view over Argostoli and Lixouri with own pool and coffee bar.